Will Scharen began his study of the trombone at age 9 in his hometown of Bozeman, Montana. He has since earned three degrees in trombone; a Bachelor of Music in performance from the University of Montana, a Master of Music in classical performance from the New England Conservatory, and the Doctor of Musical Arts in performance and pedagogy from the University of Colorado. Many successful and dedicated students have passed through Will’s private studio. 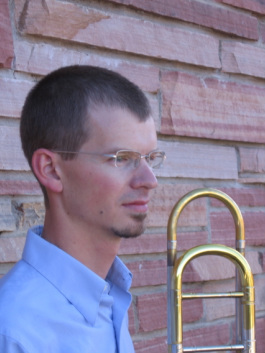 Will has been teaching trombone for the last 15 years in Montana, Washington, and Colorado, and Medford, Oregon. In addition to his private studio, Will has taught at the University of Colorado and Regis University. As a professional trombonist, Will enjoys an active schedule, holding positions as second trombonist of the Cheyenne Symphony and Rogue Valley Symphony, as well as trombonist for Justin Shandor's Ultimate Elvis Tribute. He also appears as a soloist, having recently performed the world premiere of his own edition of Eugen Reiche's Concerto No. 1 with the Mayo Chamber Symphony in Rochester, Minnesota, as well as having given guest recitals in Montana and Wyoming. When not behind the mouthpiece of his trombone or guiding the next generation of young trombonists, he enjoys spending time with his wife, cooking, and pursuing one of his many outdoor hobbies in the mountains.